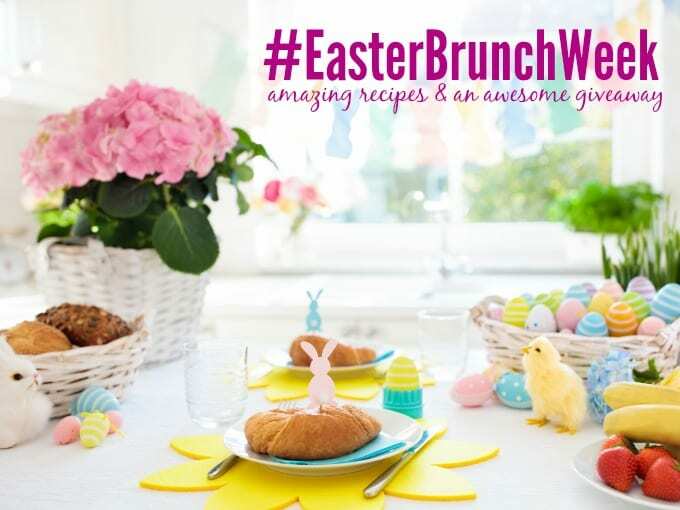 As Easter Brunch Week continues I couldn’t finish the week without a great waffle recipe! Don’t forget to enter to win the great prizes from our sponsors! Full details are here! I have your egg recipe covered with this yummy Sausage and Egg Casserole! Then we have a sweet treat with a Lemon Yogurt Cake! To a refreshing beverage, Peach Sangria! 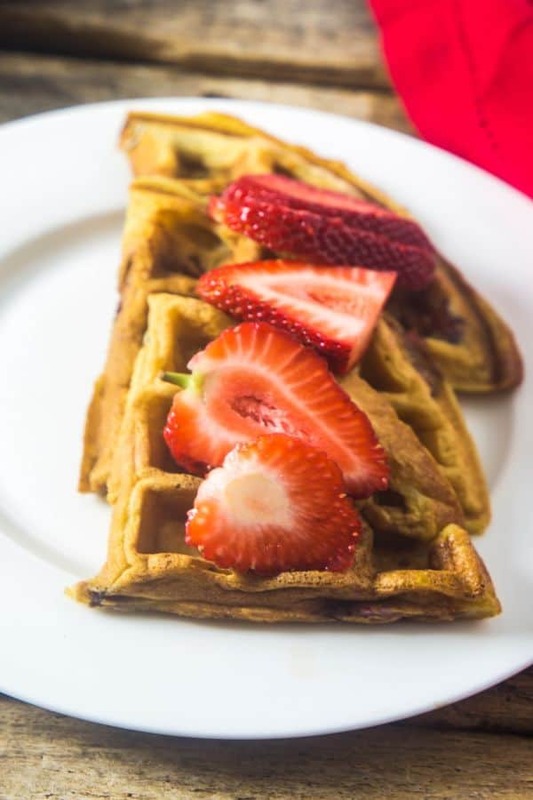 To keep the deliciousness going a fruity waffle is a perfect addition to Easter Brunch or any brunch for that matter! Mother’s Day is another great day to enjoy these waffles. 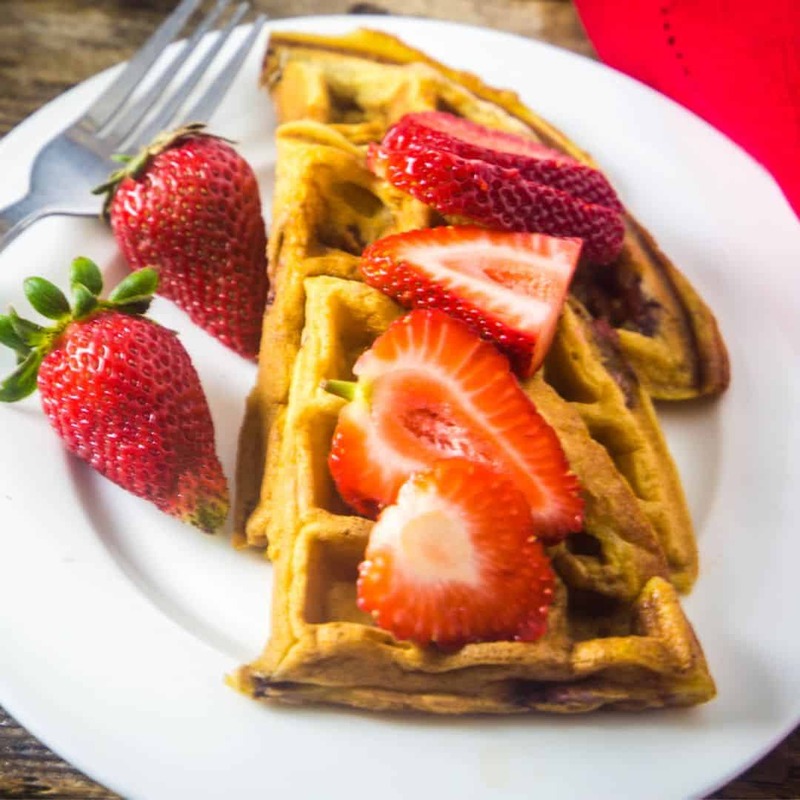 These tasty Strawberry Waffles are made with the Hamilton Beach Waffle Maker! I love this waffle maker because it is non-stick with removable plates! The waffle maker also has an adjustable browning mechanism so you can adjust the browning factor! The waffles come out super crispy on the outside and tender on the inside! Always perfect waffles! Strawberries are another fruit that makes me go immediately to spring and summer! It is one of my families favorite fruits too! I have been making waffles forever! They are not only easy to make but they are a perfect make ahead meal too! You EE regulars know I love make ahead meals! Waffles are awesome because they are not just a breakfast food! They are a great snack and in a pinch, dinner is served! Who else loves breakfast for dinner besides me? Can Strawberry Waffles be frozen? Absolutely! These waffles freeze so well. I make a huge batch and freeze a few wedges together. Wrap waffles in aluminum foil, reheat in the oven at 350 degrees for about 5-8 minutes. Also the toaster oven works, generally about 5 minutes. 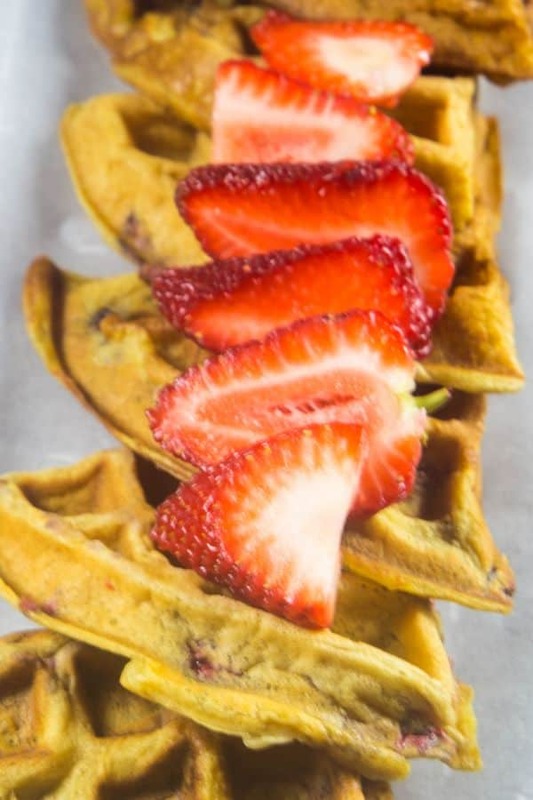 Can frozen strawberries be used in these waffles? Yes. I freeze strawberries a lot. When they are in season and the price is good! Do it! Also store purchased frozen strawberries are great too. 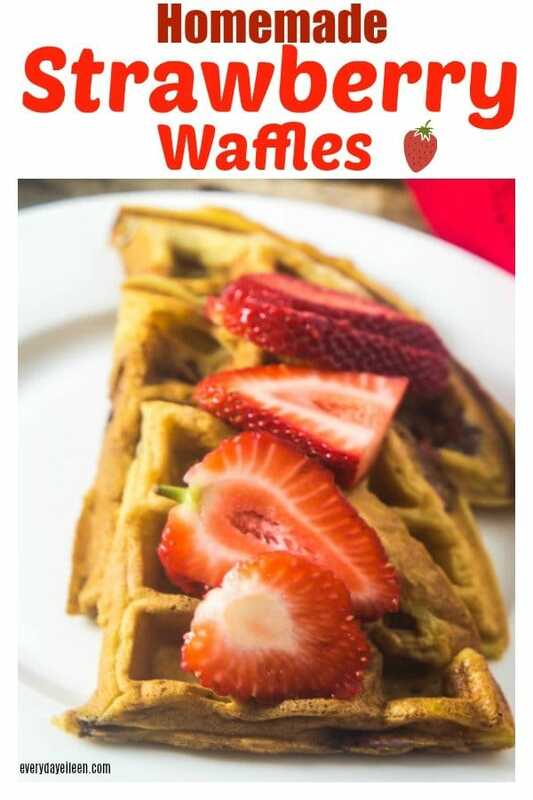 Want to change things up, Strawberry Waffles can even be served as a dessert! Top with fruit, chocolate sauce, some whip cream, yum! Dice the strawberries into bite size pieces. Separate the yolk and egg whites in two seperate bowls. Whip the whites with a blender and set aside. Into the egg yolks, blend in buttermilk, and vanilla. 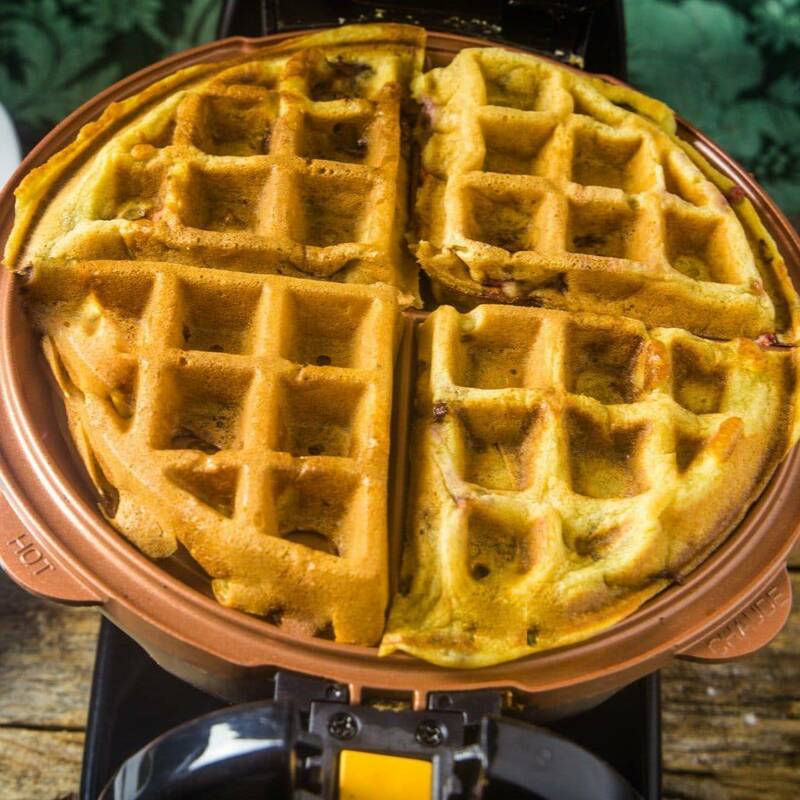 Pour enough batter in the waffle maker to make one waffle. 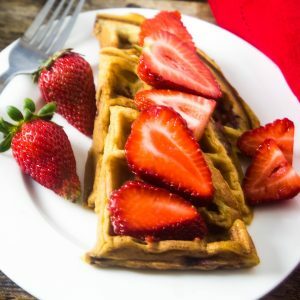 Homemade Strawberry Waffles are light and fluffy! Easy to prepare and are easily frozen for make ahead breakfast! 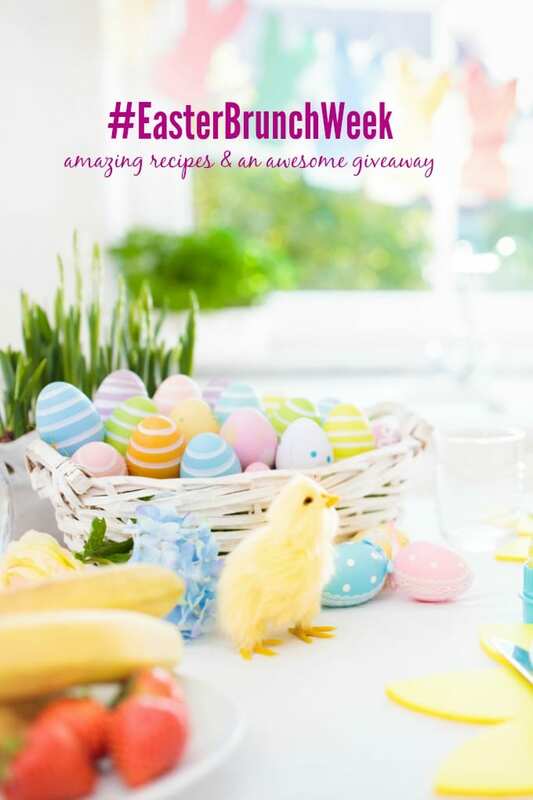 A perfect addition to your Easter Brunch! Bring some along to celebrate Mom on Mothers Day! In a medium bowl, sift together flour, sugar, baking soda, and salt. Set aside. Whip the egg whites until light and fluffy and set aside. Lightly beat egg yolks. Add in buttermilk, canola oil, and vanilla extract. Mix in the dry ingredients. Gently fold in the egg whites and fresh strawberries. Heat waffle maker according to manufacturer's instructions. Spray waffle maker with non-stick spray and pour in enough batter to make a waffle. Follow waffle maker instructions to make your remaining batter. Serve waffles with fresh strawberries and maple syrup. Note 1: I have not done a tutorial on separating eggs yet. This one by The Pioneer Woman is a great tutorial with a few options. Note 2: If using frozen strawberries, let defrost slightly and then chop into bite size pieces.